While worldwide golf viewership may be waning as a result of non-appearances by its biggest draw card Tiger Woods, it is a sport that is still watched on television and followed on social media by many millions of viewers across the globe. The challenge for championship organisers today is the same as it has always been, attracting sponsors, particularly title sponsors, at a time when companies across the globe are shrinking their marketing budgets and reconsidering current sponsorships. The result of shrinking sponsorship is fewer championships, and the costs involved for organising premier, broadcast-worthy championships run into millions of dollars. The run-on effect of fewer televised championships is a reduction in personal sponsorships for professional players, as marketers look elsewhere for prime placement resulting in stronger coverage of their brands. Without these important sponsorship deals, players will be hard pressed to continue to maintain their professional status as travelling costs alone to the various tournaments can break the bank. Lack of golf sponsorship (and sports sponsorship in general) also has an impact on tourism in the regions where the championships are played as visitors which flocked annually to watch the various competitions live, no longer have the impetus to visit the host regions. It’s not all doom and gloom however, there are thankfully still companies and brands who are fully invested in the sport, and who are helping to ensure the growth of the game. 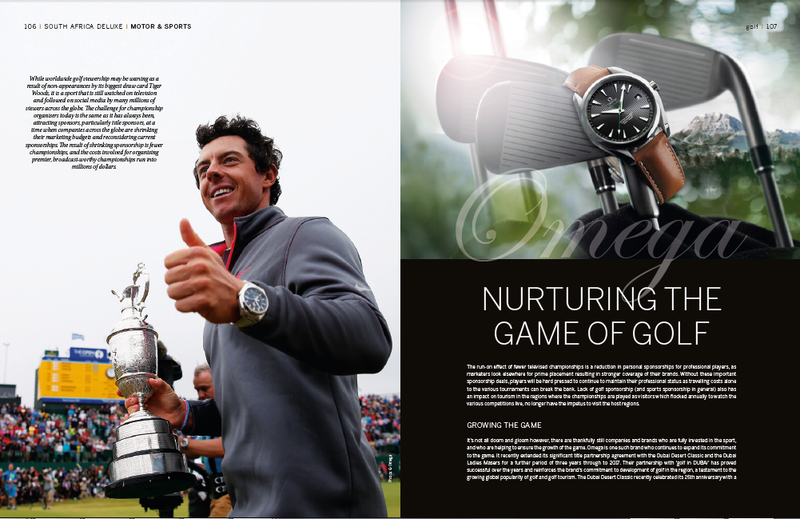 Omega is one such brand who continues to expand its commitment to the game.